Which symbol should replace the question mark in the above pattern? You can solve this puzzle with a printed version of it; that is to say, there's no steganography or other means of encryption involved here. The square layout of the tiles is irrelevant. 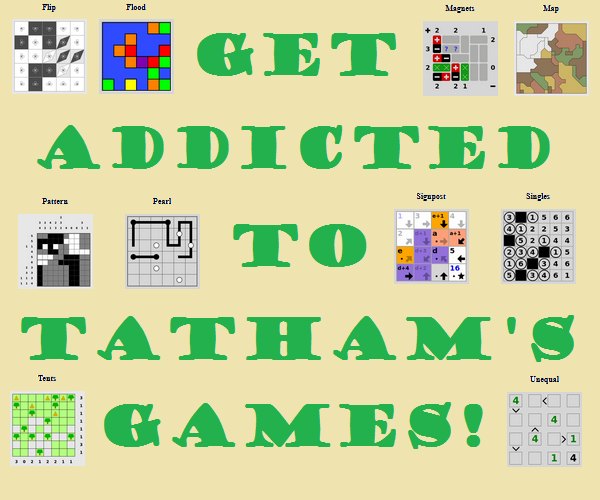 They go in a specific order, and this puzzle could just as well be solved with the tiles laid out in a straight line. There is no 'misleading' information in the puzzle. Every single piece of the puzzle is relevant to its solution. The pattern will be obvious once you discover it. If at any point it feels like a stretch, or you seem uncertain about anything, you're on the wrong track. Try not to get too caught up on the word pattern. Looking for patterns in the colors will most likely not get you to the right answer. This puzzle would work in black and white - the colors simply add a nuance. The dots are a binary representation of the digits in the golden ratio (1.61803398), with each primary color representing a 1, and secondary colors are a 0. 0001 0110 0001 1000 0000 0011 0011 1000, and the only block that could be 1000 is B, Yellow Purple Purple Purple. Edit: looks like I was beaten. Splitting the pattern into 9 "fields", each field consists of two "complimentary" colours. Red/Green Blue/Orange Purple/Yellow. Each of the fields is either a duplicate or the colour-inverse of another, with the central all-green tile being an exceptional piece. (As there are an odd number of tiles, one has to be a "stand-alone" item. Central and of one colour only seems to be an appropriate choice.) This leaves the tile which looks like the "B" tile to require a double or an inverse, and tile B is the only one fulfilling this requirement. All tiles on the left need a duplicate on the right. The central column is symmetric and otherwise just a distraction. "The square layout of the tiles is irrelevant." First, we need to now what we have here: 6 different colors, 8(+1) tiles, 4 colored circle in each tiles, Only one colored circle can link another one, only one tiles is fully filled with only one color, colors have their own pattern (green + red, orange + blue, yellow + purple), only the (orange + blue) pattern are equal (2 of each of them in their tiles). Now, we can start conceptualizing the pattern by asking some question: does those colored circle linked each others mean we need to read them like this (bottom-left > top-left > top-right > bottom-right) ? If yes, does we can say they are like rainbow ? If yes, RED=1,ORANGE=2,YELLOW=3,GREEN=4,BLUE=5,PURPLE=6 ? If yes, does that mean that each color pattern is equally distanced by 3 (Green = 4 / Red = 1, Orange = 2 / Blue = 5, Yellow = 3 / Purple = 6)? If yes, that mean 3 must be our delimiter for calculating our pattern ? If yes, can we say that we need to read 3 tiles by 3 tiles ? If yes, we can easily see that each of those 3 row of tiles are hugely different in term of colors and number of same colors, right ? If yes, does we will need to read by a logical order following the "arc / rainbow line" ? If yes, that will mean that the type of colors, the color at the start/end and the order of them in the tile is Irrelevant ? If yes, this will indicate that only the colors switching is relevant ? If yes, how can we calculate it ? 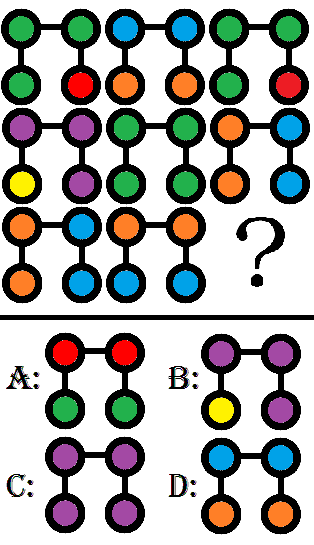 Maybe, by giving to each tile a point for every color switched, in example: (green,green,green,red = 1) / (orange,blue,blue,orange = 2) / etc.... By this theory, only one symbol can be our next symbol in the pattern: B --Since B is the only tiles with 1pts color switching in those suggested symbol. Answer B, which has 1 color change.